In this post I will show you a quick example of how to write an on-the-fly table in SQL Server. Knowing how to quickly write an adhoc on-the-fly SQL table can come in handy mostly when performing administration tasks (such as adhoc queries), or to create a customized small tally-tables, which are used to aid the processing of your query. 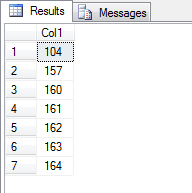 There are many ways to building an on-the-fly table in SQL Server, you could essentially construct it by appending rows (using UNION) until the table is formed, but that is not very nice in terms of readability and maintainability. Essentially using the SQL Server VALUES clause, one can build a SQL table on the fly that can be used to drive the query you are trying to perform. Hope this helps. Happy SQL-ing.